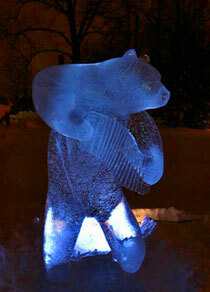 Ice bear playing his ice accordian, “Elämää Suomalaismetisissä” or “Live in Finnish Forests,” Helsinki, Finland 2004. Sculpted by Paavo Koberg and Tuomo Ylitalo. What comes to mind when you think of ice sculpture? Have you seen glistening swans gliding along an extravagant wedding buffet? A company logo melting at a business banquet? Maybe what comes to mind is an ice hotel somewhere in Sweden? Culinary ice carving can be exquisite. However, ice, as an art form, has a robust and fantastic life that extends beyond these mostly indoor venues. Artists in the northern reaches of the planet use natural ice as an expressive art medium. Throughout the world annual competitions, celebrations of solstice, and exhibitions all bring excellent artists into the freezing weather to show their carving skills.